Been a few weeks since I have done an SIL. Mainly, I have been busy with life, and by the time I get to the computer, it's so late I hate to post anything that will just get buried in the blog roll. Not saying any of my writing is amazing, but I wouldn't write if I didn't hope someone gets some enjoyment out of reading my words. Two by three what? Who bookmarked this crap? So let's do a pretty quick SIL. If you see the tabs at the top, or if you know my site enough, I am working on Billy Pierce's complete set of cards issued while playing. Not saying I may not pick up one's issued after he retired, but those are not part of the project. I just added card #9 to the group. Here is his first issued baseball card - 1951 Topps Blue Back. I nabbed this really nice copy for 75% the cost of a blaster. All four corners are perfect. The only real issue is the blue back is a little off center. 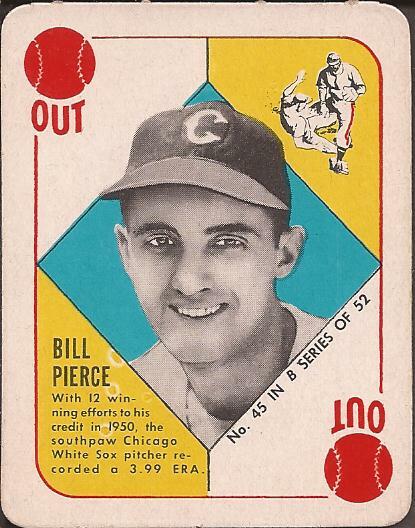 Billy Pierce Project - 36% complete!